The Neurovascular unit (NVU) is a physiological entity that consists of fine-tuned interactions between cerebral blood vessels, pericytes, astrocytes, immune cells and neurons in order to maintain brain homeostasis. The NVU contributes to brain vessel properties such as blood-brain barrier (BBB) and cerebral blood flow regulation. Several brain disorders are associated with NVU dysfunction. There have been several recent advances in knowledge and in the technologies available to study the NVU. This advanced course will allow students to gain basic knowledge and hands-on experience with in vivo/ex vivo high-resolution imaging, notably 2-photon microscopy, fluorescence lifetime imaging, STED microscopy, optogenetics, vascular molecular biology and magnetic resonance imaging. This course will provide hands-on training in nine mini-projects spread over 3 weeks in groups of 3-5 students per project. Students (max 20) will follow the theoretical and methodology course that are headed by leading scientists in the field. Every day begins with a keynote lecture followed by lectures by instructors that are established and upcoming scientists in the field. The afternoon and part of the evening is spent with the mini-projects that in this 3-week course run in two blocks. The first block is dedicated to neurovascular coupling issues while the second block is dedicated to brain ion and water homeostasis, the blood-brain barrier, vascular biology and magnetic resonance imaging of rodent brains. The venue is the Neuroscience Training Labs at the Bordeaux Neurocampus and the duration of each training (hands-on) term is seven days. The training laboratory is fully dedicated to the course and equipped with all types of equipment required for cutting edge research in neurovascular function and brain homeostasis. The methodologies and expertise to run the mini-projects are based on the contributions of external instructors from leading labs. We plan several extracurricular activities in between the program including evening sessions with open discussions and social events. Participants will have the option to work with the mini-projects described in the following and will be given the option to prioritize between projects in both the 1st and 2nd block. Block 1 is running from May 19 to May 28 and deals with neurovascular coupling issues. The implementation of both in vivo and ex vivo preparations are vital in investigating neurovascular coupling. Pharmacology is a powerful tool to study the mechanisms of this coupling, however, it is often difficult and inefficient to carry out in vivo, stressing the importance of including ex vivo studies. We will conceptually focus on the strengths and drawbacks of ex vivo experiments, such as the lack of vascular tone, and how the drawbacks can be compensated for. Acute coronal brain slices will be obtained from Sprague Dawley rats and incubated with a the green-fluorescent calcium indicator, Fluo-4. Healthy vessels close to labeled astrocytes will be identified in the deep layers of the cortex. Glass microelectrodes will be used to stimulate neuronal activity in layer I/II and record the fibre volley and field potentials near the vessel of interest, while concurrently imaging astrocytic calcium and vascular responses. A thromboxane analogue, U46619, will be bath administered for at least 5 minutes to pre-constrict the vessel. In a second experiment, tetrodotoxin (a blocker of voltage-gated sodium channels) or CNQX (a blocker of the AMPA receptors) will be bath applied during the experiment. Tetrodotoxin is expected to block both the fibre volley and post-synaptic field potentials, while CNQX is expected to block the field potentials alone. Both manipulations should block neurovascular coupling; i.e., the stimulation-evoked response of the vessel. Vascular responses will be analysed by measuring the vessel lumen diameter over the time course of the experiment. Monitor and analyze astrocytic and vascular responses. A very well-characterized model to study NVC in vivo is the sensory pathway. It has clear topographic organization, where a single whisker stimulation can induce a localized hemodynamic response in the corresponding barrel in the somatosensory cortex. We will use this model to initiate the students to in vivo investigation of the NVC. In anesthetized animals, we will map the hemodynamic signals evoked by sensory stimulation using 2-Dimensional Optical imaging spectroscopy (also known as wide field optical imaging), and measures of cerebral blood flow using laser Doppler flowmetry and laser speckle contrast imaging before and after the administration of various drugs. Learn how are prepared in vivo cranial windows over the cortex, both acute and chronic preparations. Learn to image through a cranial window using a laser-Doppler flowmeter, an Optical imaging system of intrinsic signals and Laser Speckle contrast imaging in a physiologically-controlled anesthetized animal. Perform an imaging protocol with recordings at baseline, upon sensory stimulation (whisker or forepaw, at various frequencies and durations) and measure the signal changes following injection of drugs. Analyze the recorded imaging data, quantify the effect of the stimulation parameters and the effects of drugs. Discuss how to apply this approach to pathological models, other pharmacological and optogenetic modulations. This mini-project provides experimental skills to explore the cellular level of neurovascular interactions in vivo, namely, to study the vascular response to cortical neural activity and the effects of focal vascular impairment (i.e., microbleed) on neural activity using two-photon microscopy and optogenetic techniques. In order to assess the impact of microvascular bleeds on cortical neuron activity, students will use two-photon microscopy to image calcium transients in somatosensory cortex in mice expressing a genetically encoded calcium reporter (GCaMP6s). 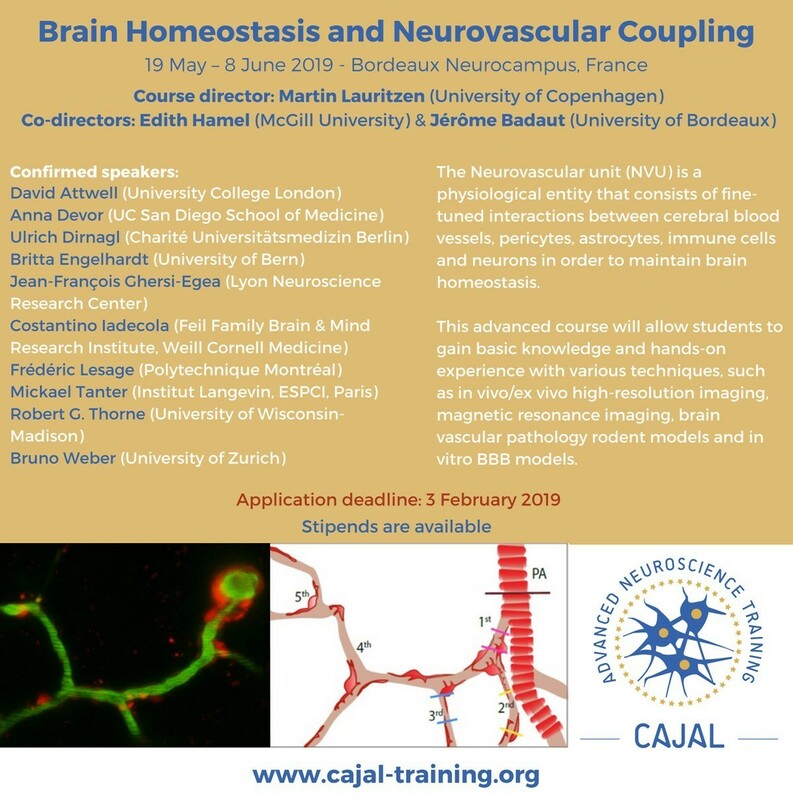 Students will image spontaneous and sensory evoked GCaMP6s calcium transients in cortical neurons before and after inducing a microbleed, using a high power laser exciting a spectrally distinct fluorescent dye in the vasculature. Students will receive instruction on technical aspects of the experiment involving the surgical preparation, spatial and temporal sampling of calcium signals, and general considerations for widefield and longitudinal two-photon imaging. Following the experiment, the students and instructors will discuss ways to interpret and analyse sensory and spontaneous GCaMP6s imaging data. In the second part of the experiments, we will characterize spatiotemporal propagation of vasoactive signals released from the activated neurons using optogenetic techniques in vivo. First, impulse hemodynamic response functions for excitatory and inhibitory neural activation will be determined using transgenic mice expressing a light-sensitive cation channel, channelrhodopsin-2 (ChR2), in either excitatory or inhibitory neurons. With focal transcranial photo-stimulation, a small number of the cortical neurons will be evoked, while spatiotemporal changes in cortical hemodynamics is captured with laser speckle flowgraphy. Then, dynamic diameter responses of cortical vessels (i.e., artery, capillary, and vein over cortical layer II/III) to the ChR2-evoked neural stimulation will be compared for excitatory and inhibitory activation under two-photon microscopy. The day following these experiments, the students and instructors will discuss ways to interpret the data sets and to further understand the physiological mechanism and significance of the neurovascular coupling. This project entails in vivo 2-photon imaging of barrel cortex of mice through a cranial window. The mice will be NG2 DsRed mice, that have pericytes and smooth muscle cells label with DsRed. We will combine the imaging of these cell with vascular dyes to measure vascular diameter and study astrocytes expressing a Calcium indicator. The aim will be to show the changes in these compartments during physiological activity as well as cortical spreading depression. The experimental part will be a session of imaging through a cranial window over the barrel cortex of the mouse. A second much smaller craniotomy will be drilled posterior to the first one to later elicit a spreading depolarization. The mouse will express a Ca2+indicator in astrocytes and will be given a fluorescent dye i.v. by tail vein injection prior to the imaging session. The Ca2+ indicator and the vessel dyes will have to be of different colors from the DsRed expressed in the pericytes. The project will let the students experience in vivo imaging of both small and local changes as well as larger, induced changes in Ca2+ levels and vessel dilations. The imaging sessions will be combined with workshops were the students will work on analyzing the data, using matlab and imageJ. The challenges will be to obtain information to describe the Ca2+ signals in a meaningful way and to evaluate changes in vessel diameter. Students will also assess the changes of vessel diameter in large or small vessels of the brain, and at vascular smooth muscle cells or pericytes. Tools exist to make these analyses, so if the students are not ready to develop something on their own, we will let them use these tools instead. They may also choose to manually evaluate the data by drawing rois etc. Working on this will give the students some insights into the data analysis process and the many decisions that are made in the course of it. This will open for a discussion of the bias introduced during the image analysis process. 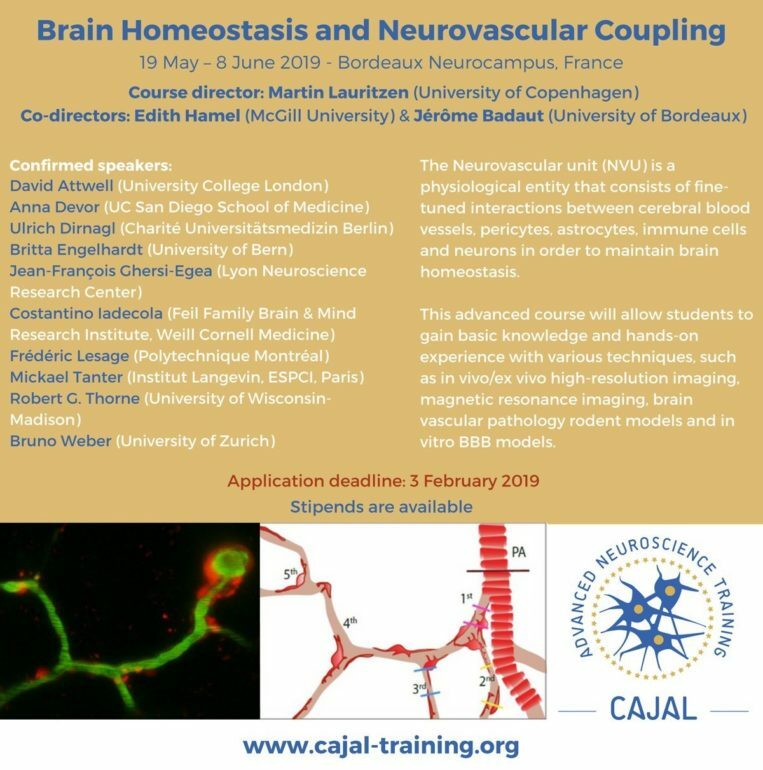 The student will get firsthand experience with in vivo 2-PM work on neurovascular coupling including preparatory surgery, Ca2+imaging, vascular imaging and elicitations of cortical spreading depression. The student will work with imaging data analysis using imageJ and matlab. The analysis can target analysis of Ca2+ signals and vessel diameter with the priority of the student. The student will acquire knowledge on the different contributions of pericytes and astrocytes to neurovascular coupling during physiological stimulations as well as cortical spreading depression. Ulf and Viki run their lecturs on experimental design, ethics, 3R, integrity in parallel with Block 1. Block 2 runs from May 30 to June 7 and deals with brain water and ion homeostasis, BBB, vascular biology, STED and structural and functional MRI. Tat-peptides are viral (HIV) protein-based cell-penetrating peptides. When injected into the blood stream, Tat peptides can penetrate the BBB and deliver conjugated drugs from blood to the brain. Although this method is currently used in Phase III clinical trials in stroke, the mechanism of how Tat penetrates the BBB remains largely unexplored. Our aim will be to characterize spatio-temporal properties of transport of fluorescently tagged Tat in the living brain. In the practical part of the exercise we will obtain imaging data that show how Tat peptide penetrates the BBB and distributes in the brain parenchyma in contrast to BBB non-permeable fluorescent dye (FITC-dextran). This will include time-lapse recordings of Tat permeating the BBB well as high-resolution imaging of Tat in the BBB and neuronal cells in the living brain. In data analysis part we will try to describe what physical processes drive the flux of TAT-peptide from the blood into the brain based on recorded experimental data. We will characterize spatio-temporal properties of Tat localization and accumulation with regard to specific cells of the BBB and the brain parenchyma. We will explain how FITC-dextran can be used to characterize physical properties (e.g. different compartments and boundaries) of the vessel and its lumen. We will explain how the measurement of fluorescence intensity in the vessel as a function of time can be used to assess drug stability in vivo. We will monitor in real time drug penetration to the brain and fluorescence intensity profiles along the vessel’s axis. We will describe how we can use this data to characterize what processes drive the flux of TAT-peptide from the blood into the brain. We will provide quick tutorials how to analyze the acquired data in ImageJ. We will provide guidelines how the methods describe can be applied to the analysis of other types of fluorescent molecules in the brain. How does intra- and extravascular fluorescence intensity changes in time for FITC-dextran and TAT-peptide and why? What is the relation between intra- and extravascular fluorescence? Do they correlate? What is the distribution of fluorescence intensity along lines perpendicular to the vessel? How these distributions contain information about the spatial concentration distribution of Tat-peptide and how is it determined by its mechanism of transport? In group discussions students will describe the advantages of using two-photon microscopy for drug/BBB studies. Fluorescence imaging in situ is a powerful tool to measure dynamics of intracellular ion changes. However, quantitative measurements across different samples, cells, compartments and during dye concentration changes (volume changes), remain challenging. In contrast to intensity-based measurements, fluorescence lifetime imaging (FLIM) measures the time course of fluorescence signal decay, a property which is independent of emission intensity or dye concentration. Experiments will be conducted with 2-photon laser scanning microscopy in cortical brain slices loaded with AM-indicator dyes. We will image neuronal Na+ using the dye CoroNa. Lifetime measurements will be made at rest and during neuronal swelling, triggered by local application of veratridine which removes inactivation of voltage-gated sodium channels. Second, we will attempt to quantify intracellular Ca2+ across a small population of astrocytes and neurons in a brain slice using the dye OGB-1. Increases in astrocyte Ca2+ will be evoked with phenylephrine (α1-adrenoceptor agonist). Students will analyze their results and compare fluorescence intensity measurements to lifetime changes. If time permits, they will also learn how to quantify cellular volume changes. Methods for calibration of lifetime to ion concentration will be discussed. Intracellular bulk-loading of AM-indicator dyes. Hands on experience imaging fluorescence intensity and lifetime. Imaging of cell volume changes. Quantification and analysis of FLIM measurements. Rungta et al., (2015) Cell, 161(3):610-21. Zheng et al., (2015) Neuron, 88: 277–288. Understanding blood-brain barrier function under physiological and pathophysiological conditions is critical for the development of new therapeutic strategies that hold the promise to enhance brain drug delivery, improve brain protection, and treat brain disorders. However, studying the blood-brain barrier function is challenging. In this regard, brain capillaries isolated from various tissues including rodents as well as human brain tissue represent a unique tool to study barrier function as close to the in vivo situation as possible. In this project, we will use a recently published protocol (1) to isolate capillaries from rodent brain tissue at a high yield and with consistent quality and purity. Brain capillaries will be isolated using mechanical homogenization, density-gradient centrifugation, and filtration. Examples will be provided for various applications that isolated brain capillaries can be used for including barrier leakage assessment, live cell imaging, and assays to study protein expression, function, localization, transport, or intracellular signaling. Hartz AM, Schulz JA, Sokola BS, Edelmann SE, Shen AN, Rempe RG, Zhong Y, Seblani NE, Bauer B. Isolation of Cerebral Capillaries from Fresh Human Brain Tissue. Journal of Visualized Experiments. (139), e57346 (2018). The development of super-resolution microscopy has created unprecedented opportunities to study the micro-anatomical organization of the living mouse brain. The Nägerl lab develops and applies cutting-edge imaging technology to make original observations about (peri-) synaptic structures and compartments and to gain insights into how their morphology and dynamics may influence information processing and neural plasticity. We have recently developed novel imaging tools based on STED microscopy 1) to analyze dendritic spines in the hippocampus in vivo; 2) to visualize the extracellular space of the brain and 3) to reveal the morphological structure and molecular arrangement of adhesive structures and synapses in live cells at the nanoscale level. Hrabetova S, Cognet L, Rusakov DA, Nägerl UV. Unveiling the extracellular space of the brain: from super-resolved microstructure to in vivo function. J. Neurosci. 2018 38(44):9355–9363. Bethge P, Chéreau R, Avignone E, Marsicano G, Nägerl UV, Two-photon excitation STED microscopy in two colors in acute brain slices, Biophysical Journal, 104, 778–785 (2013). Brain homeostasis dysfunction: From neuroimaging to cellular and molecular changes. Homeostatic dysfunction in the brain or brain edema is an acutely life threatening part of the pathophysiology of multiple cerebral disorders, including traumatic brain injury and cerebral ischemia. Brain edema is defined as an accumulation of water in the brain parenchyma but the molecular and cellular mechanisms are still poorly understood. The development of magnetic resonance imaging (MRI) tools based on water diffusion and tissue relaxation properties has provided an innovative way to examine edema development longitudinally and in real time in pre-clinical models and clinically in patients. This practical course will use approaches including MRI to assess temporally edema processes after traumatic brain injury and stroke. Immunohistochemistry will characterize changes in transport proteins of the neurovascular unit such as water channels and markers of the tight junctions. We will present analysis methods for MRI and histology data along with difficulties and caveats in their interpretations. Describe the molecular mechanisms in edema formation and resolution. Analysis workflow to quantify MRI and immunohistochemistry data. Smooth muscle phenotype is highly dynamic and responds to a broad variety of both physiological and pathophysiological perturbations. In turn, changes in phenotype determine both the structural and functional characteristics of cerebral arteries, and are driven externally by the action of growth factors, cytokines, mitogens, shear stress, and many other influences that alter patterns of gene expression within cerebrovascular smooth muscle cells. 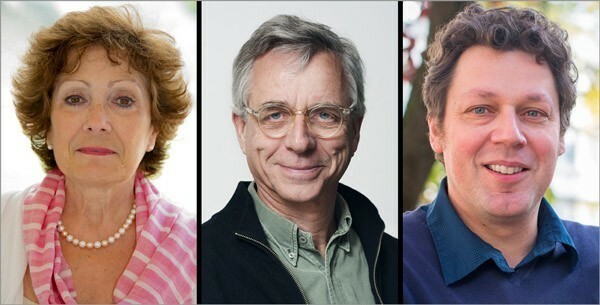 This session will provide experience with the techniques used to isolate large and small cerebral arteries, manipulate patterns of gene expression in these arteries, and then assess how these manipulations alter gene expression, contractile protein organization and smooth muscle phenotype.